Ben & Jerry's is offering a few of their signature flavors with a slight twist for new Flavor Flips. Available for a limited time at Ben & Jerry's scoop shops, the new or "flipped" flavors are coming out on a staggered release schedule. 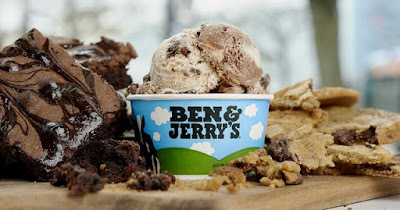 First up, is Totally Baked, a twist on Half Baked featuring chocolate and vanilla ice cream with fudge brownies and fully-baked chocolate chip cookies. Half Baked is so named because the brownies are baked but the cookie dough is not. Funny how a flavor so fictitious, turned out to be surreally delicious. like a thrill-ride on a Harley. Is just the tip of a long strange tale. *Spoiler Alert* I don't know what flavor #2 is but I figured out that flavor #3 is Cherry Garcia (the lid is referenced in this origin story).